This painting "homesickness," was done in 1940 by Rene Magritte. He was a powerful surrealist painter who placed all of his emotions into his paintings.Features a depressed Magritte as an angel leaning over a bridge contemplating the river, perhaps thinking of suicide. the loss of his home and his wife was the source of his depression. 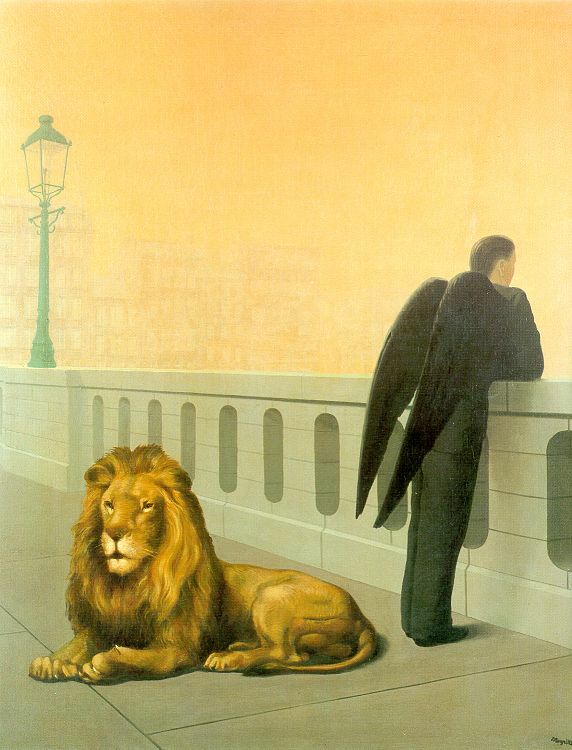 he viewed the lion as his wife, very uninterested and harmless.The two are separated, not interested in each other, while Magritte contemplates his sorrow, his sadness, his rejection. the reason i chose this painting is because although it is surreal, it shows his real life emotions. it might not be very obvious as to what the painting is about at first, but to the artist, all of his emotions were placed into his work and tells a story.